Supermarkets transformed the food shopping experience by providing a wide variety of goods, self-service, and consistent pricing. Dependent on volume sales and a large customer base, supermarkets thrived in newly built suburban shopping centers that offered plenty of free parking, a necessity for car-dependent suburbanites. Publix Super Markets built suburban strip malls in Florida, anchored by their own stores. Their supermarkets were early to offer air-conditioning, bright lighting, expansive frozen-food cases, and magic-eye automatic doors. Sylvan Goldman of Oklahoma City invented the first wheeled shopping cart in 1939. In 1946, Orla E. Watson of Kansas City developed the familiar telescoping shopping carts that nestled together for compact storage. Watson claimed that each additional parked cart required “only one-fifth as much space as an ordinary cart.” Gift of Edith Watson. 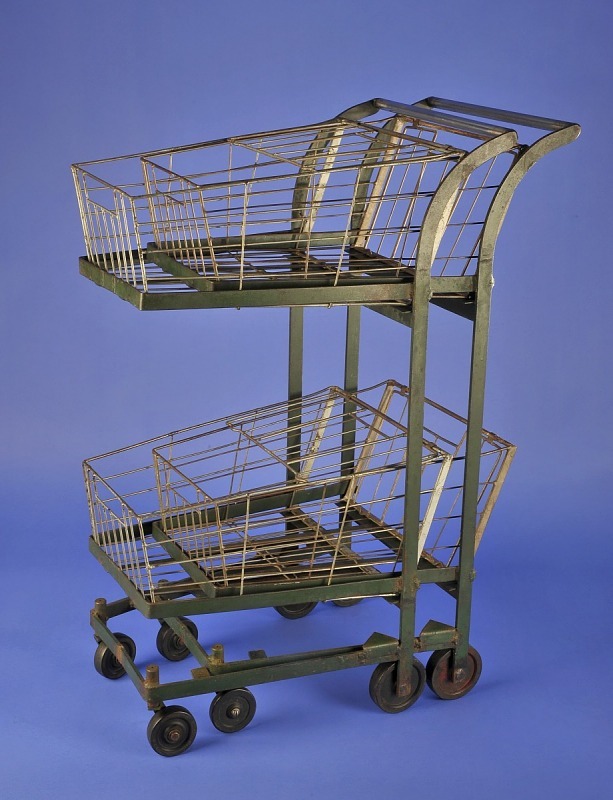 The advent of telescoping carts meant more carts for shoppers as well as more retail space for store owners. Nicknamed the Taj Mahal of supermarkets, Publix promoted its spacious aisles by driving a shopper around the store in a car. Courtesy of Publix Super Markets, Inc.